What is the PBPK Submodel? PBPK Scaffold for Compound W. The scaffold for Compound X is identical, while Compound Y is a simplified representation with only two compartments: the volume of distribution and the liver. 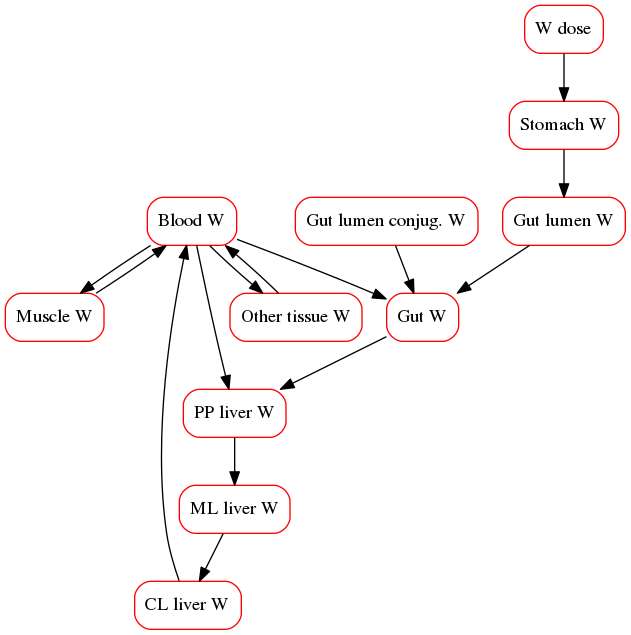 This submodel consists of a physiologically based pharmacokinetic (PBPK) model used to calculate the tissue distribution and elimination of a particular compound. The dosing routes include oral, intraperitoneal, and intravenous (bolus and infusion). Tissues explicitly represented include the liver, gut (small intestine), muscle, and blood. The ‘other’ tissue compartment is comprised of all other tissues not explicitly mentioned. Distribution to liver, gut, muscle, and ‘other’ tissue can be represented by either perfusion (flow)-limited or permeability-limited models. Saturable, transporter-mediated uptake and efflux processes are represented in the liver tissue. The transporter-mediated uptake of compound into the liver can be induced or repressed by liver compound. The process of oral absorption includes the stomach and lumen compartments to allow for gastric emptying effects. The size of the liver and the amount of blood are subject to change from their baseline values based on the amount of cellular necrosis. The primary method of clearance from circulation for many xenobiotics is biotransformation in the liver. The metabolites are eventually eliminated in the urine or bile. The periportal, midlobular, and centrilobular acinar regions are each represented to enable representation of the assymetric distribution of the enzymes responsible for drug metabolism, such as the cytochrome P450 (CYP450) family of enzymes. The compound metabolites move from the periportal zone into the midlobular zone, then into the centrilobular zone, and then into the blood, in the direction of blood flow. Both the parent compound and its metabolite can be converted to a reactive metabolite (RM), which can bind to proteins and form protein adducts, bind to glutathione (GSH), or be deactivated. Other PBPK modeling platforms, such as GastroPlus®, can be employed to support simulations with DILIsym as well, by using DILIsym’s “Specify Data” feature. This feature allows users to specify time-course inputs based on external simulation results, e.g. liver concentrations, to be used in their toxicity predictions.